The bad news: Your wages are declining. The worse news: Surveys documenting falling wage actually under-estimate how much your wages are declining. A recent entrant to this labor literature, a research paper titled “Decomposing the Productivity-Wage Nexus in Selected OECD Countries, 1986-2013,” studied 11 advanced-capitalist countries and found that in eight of them median wages have not kept pace with growth in labor productivity. To put the preceding sentence in clear language: You are producing more and getting paid less. The 11 countries studied were Canada, the United States, Norway and eight members of the European Union — Denmark, France, Finland, Germany, Ireland, the Netherlands, Spain and the United Kingdom. Working people in the United States will not be surprised to find that the widest gap between pay and productivity growth occurred there, with Germany in second place. Spain, Norway and Ireland were the three exceptions, although in each the gain in wages over productivity is small. Globalization, yes, but what is behind globalization? Are these causes some natural phenomenon like the tides in the ocean? Or might there be reasons behind these explanations? To this we will return. But, first, it should be noted this report under-reports the extent that wages are falling behind, which the authors readily acknowledge. This under-estimation is revealed when the differences between average and median real hourly earnings are reported. This matters because an average is the midpoint between highest and lowest, while median represents the earner at the point where half make more and half make less. When those at the top make more and the rest make the same, the average goes up while the median stays the same; thus examining median income as opposed to average gives a more accurate representation. Of the 11 countries examined, the authors report that median hourly earnings fell further behind average hourly earnings in 10, with France the exception and there the change was minuscule. This finding represents fresh proof of increasing wage inequality. The biggest increasing in this measure of wage inequality is — surprise! — the United States, followed by Britain. OK, United Statesians or Britons reading these lines won’t be surprised. Only the wages of the top one per cent grew faster than productivity growth. David Ruccio, in a brief post for the Real-World Economics Review Blog, reports that the labor share of income in the United States is the lowest it has ever been since the end of World War II. The tendency throughout the period has been for decline, but the decline has been much steeper since 2001 — labor share of income in the U.S. is 15 percent lower than it was in 2001. Skewing those results is that the share of income going to the top one percent has doubled since the mid-1970s. So the income share of working people has actually worsened more than the overall statistic indicates. Concurrent with the increasingly precarious state of working people are dwindling labor rights. No country on Earth fully safeguards labor rights, the International Trade Union Confederation found in its 2017 Global Rights Index report. On a scale of one to five, with one representing the countries with the best ratings (merely “irregular violations of rights”) and five representing the worst (“no guarantee of rights”), Britain and the United States received rankings of four. Thus inequality being the most pronounced in those two countries, so fond of finger-wagging at the rest of the world, comes as little surprise. And still less so considering the immense pressure financial capital puts on corporate executives to squeeze ever more out of employees, exemplified by Verizon Communications attacking its workforce to the point of forcing its employees to go on strike despite racking up $45 billion in profits over five years and Wall Street judging even merciless Wal-Mart as insufficiently ruthless in extracting billions of dollars in profits out of its employees. Well, it’s all a misunderstanding then? If only we speak up, and point out the unfairness of this, somebody out there will do something about it. One imagines that members of parliaments and congresses are largely aware of growing inequality. But if political policies are doing what the sponsors of those policies expect them to do, just what should we expect those office holders to do? This sort of class warfare rages on because only one class is waging it, and that class has the means to dominate society through a mass of institutions paid to do their bidding, control of the mass media and ability to buy government and the legislative process. Does anybody believe that Donald Trump, or Theresa May, or Emmanuel Macron, or Malcolm Turnbull, upon receiving a well-written letter explaining the problem, would then slap their heads to their forehead and exclaim, “I never realized this was happening!” Pigs, elephants and polar bears will all fly long before any such epiphanies. We can add leaders of the past, such as Gerhard Schröder, to the list. It was the former Social Democratic leader, when chancellor, who pushed through his “Agenda 2010” legislation to codify austerity on German workers, which, inter alia, cut business taxes while reducing unemployment pay and pensions. German wages have been suppressed since 2001 in relation to inflation or productivity gains — the prosperity of German manufacturers has come at the expense of German workers. Globalization, pointed to by the two authors of “Decomposing the Productivity-Wage Nexus” as a culprit, doesn’t happen in a vacuum or because some capitalist somewhere woke up in an ornery mood. Globalization is the response of industrialists and financiers to the rigors of capitalist competition. Once the limits of Keynesianism were reached in the 1970s, and the growth levels of the mid-20th century could no longer be sustained, capitalists ceased tolerating wage increases. Instead, from their perspective, they needed to force through wage cuts to maintain profit margins. Relocating production to places with lower wages and fewer regulations was the answer. Mergers, with attendant layoffs, are another response to capitalist competition. Once one capitalist succeeds with such an “innovation,” the others must follow on pain of losing their competitive position. The need to move raw materials and finished products across borders, from the capitalists’ point of view, necessitates the lowering of barriers and borders to trade, and thus the increasing harshness of so-called “free trade” agreements that are promoted by multi-national corporations. Globalization is not some natural process beyond human control, but rather is the result of capitalist competition — of allowing markets to decide ever more outcomes. When one side has so many more resources and weapons at its disposal, it’s no surprise that class warfare is such a one-sided affair. If we want the world to be otherwise, we’ll have to struggle for it. Everything of human creation can be changed by human effort, including the world’s failing economic system. You are working harder while not making more. It isn’t your imagination. The latest research demonstrating this comes, interestingly, from the St. Louis branch of the United States Federal Reserve. Perhaps the researchers examining the relation between wages and productivity hoped this work wouldn’t be noticed by the public, as it was published in an obscure publication, Economic Synopses, produced by the St. Louis Fed. Regardless, it is of interest. The two authors, B. Ravikumar and Lin Shao, not only found a divergence between rising productivity and stagnant wages in the current “recovery” from last decade’s economic collapse, but that this has been a consistent pattern. Looking back to the previous officially designated recession in the U.S., declared to have ended in 2001, the authors found that over the following five years productivity increased about 13 percent, while wages increased by about five percent. Overall, the authors summarize by demonstrating that wages have lagged productivity by a wide margin since 1950, with the gap beginning to widen in the 1970s. Productivity in 2016 is 3.8 times higher than it was in 1950, while wages are only 2.7 times greater. Hmm, something mysterious? Or as natural as the tides of the ocean? Well, no, if we think for even a moment about the asymmetric class warfare that has raged for decades. Yet neoclassic economic ideology (and not only its extreme Chicago School variant) continues to insist that we get what we deserve and that labor is compensated for what it produces. Neoclassical economics is an ideologically driven belief system based on mathematical formulae, divorced from the conditions of the actual, physical world, and which seeks to put human beings at the service of markets rather than using markets to provide for human needs. Economic activity is treated as a simple exchange of freely acting, mutually benefitting, equal firms and households in a market that automatically, through an “invisible hand,” self-adjusts and self-regulates to equilibrium. Households and firms are considered only as market agents, never as part of a social system, and because the system is assumed to consistently revert to equilibrium, there is no conflict. Production is alleged to be independent of all social factors, the employees who do the work of production are in their jobs due to personal choice, and wages are based only on individual achievement independent of race, gender and other differences. The real world does not actually work this way — the executives and financiers who reap fortunes from the huge multi-national corporations they control and who can bend governments to their will have rather more power than you do. Neoclassical economics does not adjust to the real world because it is, at bottom, an ideological construct to justify massive inequality, which is why two other Federal Reserve researchers declared that the reason for economic difficulty in recent years is that wages have not fallen enough! Stagnant or declining wages, however, are quite noticeable in the real world. Independent studies have found that the lag of wages as compared to productivity costs the average U.S. and Canadian employee hundreds of dollars per week. That is by no means a trend limited to North America — employees in Britain, France, Germany, Italy and Japan have experienced differentials between wages and productivity, albeit not as severe as what is endured by U.S. workers. Where is the extra money taken out of employees’ pockets going? Not necessarily to the bosses at the point of production — financiers are taking an increasingly large share of profits. Financialization is a response to declining rates of profits and that the one percent have more money flowing into their bank accounts than they can find useful outlets for investment. During periods of bubbles, financial speculation becomes more profitable than production, drawing still more money and thus increasing the already bloated size of the financial industry. In turn, ultra-low interest rates help inflate stock-market bubbles, in effect acting as a subsidy for financial profits. The world’s central banks have flooded financial markets with more than US$6.5 trillion (€6 trillion) in “quantitative easing” programs, and all that has been accomplished is the inflation of a stock-market bubble because speculators have poured money into stock markets in the wake of low bond returns resulting from the quantitative easing. Concomitantly, corporate executives have borrowed money at low interest to fuel a binge of buying back stocks, adding to speculative fevers. In an interesting article in the July-August 2016 issue of Monthly Review, “The Profits of Financialization,” Costas Lapavitsas and Ivan Mendieta-Muñoz calculate that the profits earned by the financial industry as a percentage of overall U.S. corporate profits increased steadily throughout the second half of the 20th century, more than tripling from 1950 to the early 2000s. Although now below the early 2000s peak, financial profits remain at historically high levels. Federal Reserve researchers may have just discovered what has long been apparent to working people and “heterodox” economists, but aren’t going to offer any solutions, must less formulate critiques of the system that produces such results. The harder you work, the richer the executives and bankers get. What if, instead, those who did the work reaped the rewards? That, however, will require a different system. Why do we work so many hours? I mean beyond the obvious answer that the dictatorial employment relationships of capitalism force us to on pain of unemployment. Working hours declined from the inhuman work weeks of the industrial revolution until the mid-20th century, when the hours we work leveled off; in more recent years work hours have been increasing. It certainly isn’t because productivity has plateaued. On the contrary, advances in machinery and computerization make us more productive than ever before. So why do we still work an eight-hour day after all these decades? (Or more than eight hours in many cases, and not necessarily with extra pay for office workers receiving a flat salary.) An eight-hour day was an outstanding achievement of social movements from the 19th century, when work days lasted 10 and 12 hours. With the advancements in productivity over the years, we could certainly work fewer hours and still provide all that is necessary. Why not a six-hour day? Or less? In Sweden, there are ongoing experiments with six-hour work days, which so far have met with success. Not surprisingly, given the one-sidedness of workplace relations, these experiments are being done in the name of “greater productivity.” In other words, the standard is to be: Will this be good for the boss’ profits? That it might be good for the workers is part of the equation, but even this is commingled with the idea that rested workers will be more productive workers and thus more profitable for bosses. At the other extreme, working more than 40 hours per week is detrimental to physical and mental health. A study published earlier this year in The Lancet found that people working 55 hours per week had a 33 percent greater risk of a stroke than those who worked 35 to 40 hours per week and a higher risk of heart disease. This study analyzed more than 600,000 individuals, through data drawn from 20 studies, in several countries. It is hardly a revelation that a tired workforce is going to make more mistakes and be subject to more accidents. The common belief by bosses that it is cheaper to force overtime on current workers, even in those cases where it must be paid when employment laws or union contracts can’t be evaded, than to hire new workers to handle increasing workloads isn’t necessarily true. Beyond the benefits to productivity or employer satisfaction, working fewer hours would be a partial compensation for pay that has badly lagged increases in productivity since the 1970s. This pattern is persistent throughout the world. It has been in place since the early 1970s in the United States and although a more recent phenomenon elsewhere in the world’s advanced capitalist countries, workers everywhere suffer from stagnant wages while producing more. U.S. workers on average earn nearly 12 dollars per hour less than they would if wages had kept pace with productivity gains since 1973. Canadian workers earn on average 11,000 dollars per year less then they would if if wages had kept pace with productivity gains since 1980. Other studies demonstrate lags in wages versus productivity in Britain, France, Germany, Italy and Japan. The bottom line is that we work more hours because bosses can extract more from us, even if they don’t extract as much as they believe they do when we are pushed beyond an eight-hour day. That a handful of bosses have the foresight to see that more profits can come from shorter work days does nothing to change that basic capitalist equation. Profits ultimately derive from the difference between what we are paid and the value of what we produce — the drive to increase this difference underlies both the stagnant pay of recent decades and the accelerating shifting of production, both manual and office work, to locations with ever lower wages and weaker regulations. What if we worked for ourselves instead? If shorter work days are beneficial to working people — and reduce unemployment by requiring more workers to carry out necessary work — why shouldn’t this be widely implemented? So far, the discussion around the length of the working day has centered around what is best for bosses, as would be expected under capitalism. (And, make no mistake, Sweden is a capitalist country, albeit one that ameliorates some of capitalism’s harshness more than most others countries.) What if the workers ran the company themselves, or managed a public enterprise themselves? A cooperative enterprise could similarly reduce the work day or possibly even more since it wouldn’t have to generate a large profit for a boss or, in the case of larger enterprises, for the top executives and shareholders. The steady increase in inequality, the immense fortunes held by the world’s billionaires that are far beyond any reasonable possibility of useful investment, the trillions of dollars stockpiled by multi-national corporations, and the immense waste of advertising and planned obsolescence attest to the fact that we work beyond what is necessary to meet human need. If the economy were organized on the basis of an economic democracy — in which production is oriented toward human, community and social need rather than private accumulation of capital — the work day could reasonably be well less than eight hours. Economic democracy can be defined as where everybody who contributes to production earns a share of the proceeds — in wages and whatever other form is appropriate — and everybody is entitled to have a say in what is produced, how it is produced and how it is distributed, and that these collective decisions are made in the context of the broader community and in quantities sufficient to meet needs, and that pricing and other decisions are not made outside the community or without input from suppliers, distributors and buyers. By no means is anything written in this article intended to be an argument against shorter, more humane working hours or higher pay today. But as such struggles intensify, as they must, they can help us move beyond reforms that somewhat lessen our exploitation to ending exploitation. If a six-hour work day is better for us, why not have more of the benefits accrue to those who do the work and to the community that supports that work? The Federal Reserve has declared that the reason for ongoing economic weakness is because wages have not fallen enough. Wages have been stagnant for four decades while productivity has soared, but nonetheless orthodox economists believe the collapse of 2008 has been a missed opportunity. A food line in Toronto in 1931; falling wages didn’t work out during the Great Depression. How many formulae can be written on the head of a pin? Although orthodox economics is often nothing more than ideology in the service of capitalist elites, its practitioners like to believe themselves scientific because they base their theories on mathematical models. Unfortunately, these formulae are divorced from the real, physical world; the economy and the human behavior that animates it are not reducible to mathematics. That was written in 1985; little if anything has changed since and arguably has gotten worse. Professor Kuttner points out that the very fact of persistent unemployment contradicts the basic theses of orthodox neoclassical economics. If the belief that markets automatically reach equilibrium were true, then wages would automatically fall until everybody had a job. Rather than acknowledge the real world, orthodox economists simply declare involuntary unemployment an “illusion,” or claim “government interference” with the market is the culprit. “Business cycles were around long before trade unions or big-spending governments were,” Professor Kuttner noted. In almost all cases, employees do not even know what wages their co-workers are earning. This top-down secrecy facilitates the disparity in wages, whereby, for example, women earn less than men. If everybody earned what they were worth, there would no such wage disparity. The very fact of disparities between the genders or among races and ethnicities demonstrates the ideological basis of orthodox economics, which assumes that employees who do the work of production are in their jobs due to personal choice and wages are based only on individual achievement independent of race, gender and other differences. Middle-class U.S. households earn $18,000 less than they would had wages kept pace with productivity, Dr. Gould calculates. Nor is that unique to the U.S.: Wages in Canada, Europe and Japan have also fallen well short of productivity gains. Canadian workers, for example, are paid at least $15,000 per year less than they would be had their wages kept pace. But as we can plainly see, and as those of us living in the real world experience, wages cuts have been the norm for a long time. The caveat at the end of the paper that it does not necessarily reflect the views of the Fed board of governors should be noted, but the paper was issued as part of a regular series by the San Francisco Fed and the authors are senior members of it, so it is not likely to be at variance with opinions there. It certainly does reflect orthodox economic ideology. Similarly, the argument by the Austrian School’s Mises Institute, stripped of its academic-sounding veneer, is a call to eliminate the minimum wage. Stagnation, declining wages and the ability of capitalists to shift production around the globe in a search for the lowest wages and lowest safety standards — completely ignored in the orthodox hunt for economic scapegoats — are the norm. Our need to sell our labor, the resulting reduction of human beings’ labor power to a commodity, and the endless competitive pressures on capitalists to boost profits underlie the present economic difficulties. Collective bargaining through unions and the needs of capitalists to retain their employees can be brakes against the race to the bottom — what the orthodox economists at the Fed and elsewhere are arguing is that these remaining brakes be removed and wages driven down to starvation levels. That is what global capitalism has to offer. Working harder and making less isn’t a great deal for you, although it certainly is good for corporate profits. The ongoing pattern of stagnant pay as worker productivity increases, having raged unabated since the 1970s, now costs an average United States household $18,000 per year in lost income. By no means a pattern limited to the U.S., the average Canadian household is short at least $10,000 per year because of pay lagging productivity gains. Wages have begun to decline in Britain, as well as elsewhere. Might your personal finances be easier with that extra money? It’s not as if there is no money for raises: U.S. publicly traded companies are sitting on $5 trillion in cash, five times the total during held during the mid-1990s. It’s not uncommon for those angered or depressed by the neoliberal onslaught of recent decades to advocate a return to Keynesianism. Alas, it is not so simple to do that, nor would it actually provide a solution to today’s economic crises. For one thing, it is not a matter of a leader somewhere decreeing that we shall now have neoliberalism instead of Keynesianism, or that another leader can simply reverse the policies. The mid-20th century Keynesian moment was a product of a particular set of circumstances that can’t be repeated. The New Deal and the rising wages following World War II were the products of mass movements — communist, socialist and union — that simply do not exist today. Mid-20th century Keynesianism depended on an industrial base and expanding markets. A repeat of history isn’t possible because the industrial base of the advanced capitalist countries has been hollowed out, transferred to low-wage developing countries, and there is almost no place remaining to which to expand. U.S. capitalists could tolerate rising wages then because of enormous export opportunities in the wake of the destruction of European and East Asian industry due to World War II and because of long pent-up domestic demand that couldn’t be fulfilled during the Great Depression and the war. The rest of the world eventually got on its feet, increasing competition, and eventually profit rates began to come under pressure. The neoliberalism that began to take hold in the 1970s, and the accompanying financialization of the economy, were a response by capitalists to what, for them, were deteriorating conditions. Margaret Thatcher and Ronald Reagan may have ushered in the age of neoliberalism, but they were the political instruments of corporate offensives. In the U.S., neoliberalism could be said to have begun during the Carter administration, when then Federal Reserve chairman Paul Volcker unilaterally began to raise interest rates sky high, inducing the deep recession of the early 1980s. We are living in very different times than the post-war years; the neoliberal offensive is the natural development of capitalism and the manic competition that mandates capitalists to grow or die. Even were it possible to bring back Keynesianism through legislation, it would at best be a temporary balm; the capitalists who are saved through such policies re-gain the power to again impose their preferred policies. There is no salvation in attempting to “stabilize” what is inherently unstable nor any realistic prospect that what is structurally unfair and unequal can be made just. The advances that are the fruits of the 20th century’s mass movements have largely been erased, with no end to the race to the bottom. This century’s mass movements will have to aim much higher than mere reforms. If you haven’t gotten a pay raise lately, you are not alone. The percentage of U.S. workers reporting no change in their renumeration remains near its all-time high, according to statistics kept by the San Francisco branch of the Federal Reserve. The San Francisco Fed’s “wage rigidity meter” — the percentage of “job stayers” who report receiving the same pay as one year earlier, rose above 15 percent in 2010 and has remained there since. For comparison, that figure was 11 percent in 2008, at the start of the global economic downturn and about six percent in the early 1980s, when this statistic first began to be tracked. For hourly workers, not surprisingly, conditions are even worse: More than 20 percent report no increase in pay, about triple the number in the early 1980s. In other words, the Federal Reserve says inequality is here to stay. So perhaps tinkering with policy that possibly could make a marginal difference — even the Fed has to keep up appearances sometimes — is the most that might be expected. Contrast that with the enthusiasm with which the Fed has shoveled money into its “quantitative easing” programs — measures that have primarily acted to inflate a new stock-market bubble with a small secondary effect of re-animating real estate prices. “Quantitative easing” is the technical name for a central bank going on an asset buying spree. In conjunction with setting low interest rates, it is a theoretical attempt to stimulate the economy by encouraging investment. The Federal Reserve’s program buys U.S. government debt and mortgage-backed securities in massive amounts. Through the end of June 2014, the Fed poured about US$4.1 trillion into three quantitative-easing programs since December 2008. The Bank of England had committed £375 billion to its Q.E. program as of the end of 2013. Prior to the economic downturn, the Fed held between $700 billion and $800 billion of U.S. Treasury notes on its balance sheet, but, because of its quantitative-easing programs, it now holds more than $4 trillion. The Fed is in the process of winding down its buying spree with an intent to finish it in October. Instability is likely to occur when the Fed tries to unload its bloated piles of assets, and many of the world’s other central banks will seek to unload their assets as well. The latest stock-market bubble, then, will burst as all others before it, with high debt loads dropping another anchor on the economy. A commentary in Forbes calculates that the level of borrowing used to buy stocks is already higher than it ever was during the 1990s stock-market bubble or the run-up before the 2008 crash as measured in inflation-adjusted dollars or as a ratio with the S&P 500 stock index. What could the world’s governments have done with this massive amount of money had it instead gone to socially useful programs? Instead, trillions of dollars were spent to inflate another stock-market bubble. One more way the world’s wealthiest have gotten fatter while the sacrifices are borne by the rest of us. And that is merely one way that inequality not only continues to grow, but is accelerating. From 2000 to 2009, labor productivity rose an average of 2.5 percent annually while real hourly wages rose only 1.1 percent, according to U.S. Bureau of Labor Statistics calculations — the biggest gap it has yet measured, going back to the late 1940s. More recent figures, according to Reuters, indicate the gap continues to grow — from 2007 to today, average hourly wages have risen a total of 1.5 percent while productivity has increased by 11.4 percent. Nor is that a phenomenon limited to the United States. The International Labour Organisation calculates that wages in the world’s developed countries increased six percent from 1999 to 2011 while labor productivity increased about 15 percent. If the employees are not receiving the benefits from their increased productivity, then it is the bosses and speculators who are grabbing it. Thus it is no surprise that the gap in wealth has increased more sharply than have incomes. A research paper written by Fabian T. Pfeffer, Sheldon Danziger and Robert F. Schoeni found that accumulated wealth has decreased for the majority of people since 1984. The median level of net worth — that is, the 50th percentile or the point where the number of people with more is equal to the number with less — has decreased by about 20 percent since 1984. By contrast, those at the 95th percentile have nearly doubled their net worth since 1984. So much money has flowed upward that industrialists and financiers, and the corporations they control, have more money than they can possibly find investment for — this money is diverted into increasingly risky speculation in an attempt to find higher returns. Working people were handed the bill for the previous bubbles, and before we can get back on our feet the bursting of another bubble looms. Class war is raging, and it’s clear what side is winning. It is not your imagination — you are working harder and earning less. 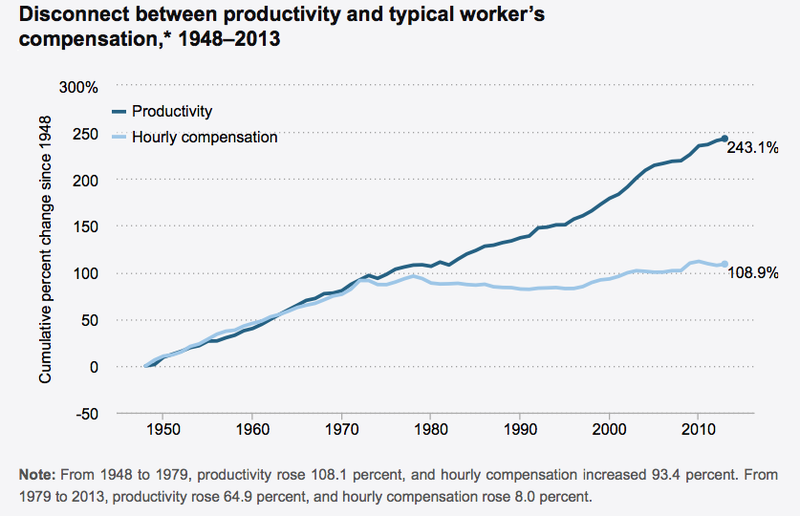 Despite significant productivity gains during the past four decades, wages have remained flat. “Freedom” is reduced to the freedom of industrialists and financiers to extract the maximum possible profit with no regard for any other considerations and, for the rest of us, to choose whatever flavor of soda we wish to drink. Having wrested for themselves a great deal of “freedom,” the world’s capitalists have given themselves salaries, bonuses, stock options and golden parachutes beyond imagination while ever larger numbers of working people find themselves struggling to keep their heads above water. On the one hand, U.S. chief executive officers earned 354 times more than the average worker in 2013. And even with the bloated pay of top executives and the money siphoned off by financiers, there was still plenty of cash on hand — U.S. publicly traded companies are sitting on a composite hoard of $5 trillion, five times the total during the mid-1990s. Almost every penny of the income generated by that extra work went into the pockets of high-level executives and financiers, not to the employees whose sweat produced it. Wage erosion is also at work in Europe. A Resolution Foundation paper found a differential between productivity and wage gains for British working people, although smaller than that of the United States. It also found that British workers did not lose as much ground as did French, German, Italian and Japanese workers. That conclusion is based on a finding that the share of gross domestic product going to wages in those countries has steeply declined since the mid-1970s. That German workers also suffer from eroding wages might seem surprising. But it should not be — German export prowess has been built on suppressing domestic wages. In 2003, the then-chancellor, Social Democrat Gerhard Schröder, pushed through his “Agenda 2010” legislation, which cut business taxes while reducing unemployment pay and pensions. German unions allowed wages to decline in exchange for job security, which means purchasing power is slowly declining, reinforcing the trend toward Germany becoming overly dependent on exports. Despite the overwhelming evidence of increasing hardship for so many people, economic orthodoxy insists we scream in horror at the very thought of raising wages. Such screaming is based on ideology, not on facts. Low-wage workers in the United States earn far less today than they did in 1968, despite their having a much higher level of education now as compared with then. The federal minimum wage is 23 percent lower than it was in 1968 when adjusted for inflation. Household spending accounts for 69 percent of the U.S. gross domestic product; persistent unemployment and stagnant or falling wages can only lead to continuing economic weakness. Demand is what creates jobs. Raising wages, which in turn would stimulate demand, would, in a logical world, appear to be one route to ameliorating stagnation. In fact, a strong consensus exists that, contrary to what the one percent and their hired propagandists say, raising the minimum wage would be beneficial. The University of Chicago, the infamous incubator of the “Chicago School” ideology that provides the intellectual “justification” for neoliberalism, can hardly be described as a pro-labor bastion. One of the demands of the March on Washington in 1963 was a minimum wage of $2 an hour. Adjusted for inflation, $2 an hour in 1963 would be worth $15.35 today. Yet the federal minimum wage in the United States is $7.25 an hour, and the highest minimum wage mandated by any state government is Washington’s $9.32. The $10.10 an hour lately proposed by the Obama administration sounds like an improvement when compared with current rates, but in reality it is the usual crumbs on offer by the Democratic Party — the White House is proposing two-thirds of what was demanded 50 years ago! Exorbitant rent increases have forced countless small businesses to close in gentrifying neighborhoods across the country. Commercial rent control that would leave mom-and-pop businesses with a low enough overhead to survive, instead of them having to send all their money to landlords interested in nothing more than squeezing every dollar out of a neighborhood, would do vastly more good than any potential harm caused by a $15 minimum wage. Close to 60 percent of families below 200 percent of the poverty line have a family member who works full-time, year-round and 47 million U.S. residents rely on food stamps. At the same time, the world’s 1,645 billionaires have an aggregate net worth of US$6.4 trillion, an increase of $1 trillion in just one year. Individualistic ideology, promoting the idea of personal responsibility for unemployment, low wages and economic insecurity, is a crucial prop holding up the system that leads to such disastrous results. There are no individual solutions to structural inequality.